While 2017 was one of the least financially volatile years in history, 2018 proved to be a reality check – especially in its final three months. The fourth quarter was beset with daily ups and downs and overall trends were palpably negative. Main culprits persisted in the form of monetary policy uncertainty, interest rate volatility, slower earnings and trade tensions between the U.S. and China. The White House’s overall instability only exacerbated the market’s trepidation. On the economic front, trends from the first three quarters persisted into Q4. South of the border the world’s largest economy continued to expand with few signs to suggest a change in direction. Yet higher interest rates, trade tariffs and decelerating global activity all point to a slowdown in world growth for 2019 (not to be confused with a reversal). Domestically, negative developments within the Canadian energy sector began prompting weaker growth expectations for the region. In particular, the industry was plagued with a combination of pipeline capacity constraints and declining oil prices. While discounted energy prices kept inflationary pressures at bay this quarter, they could not prevent the shift in overall economic tone from optimistic to cautious. It’s no wonder investors began focusing on economic crosscurrents and fading tailwinds this quarter – despite a cooler yet still solid outlook. Going forward, the bullish case points to a global economy in relatively solid shape. Yes, growth is slowing, with trade tensions and political instability offering added reasons for concern. Yet most economic indicators continue displaying moderate to robust expansion. In the U.S. for instance, the Bureau of Labor Statistics shocked market participants by reporting a 312,000 rise in new jobs for December. The substantial gain was nearly double the 177,000 increase that forecasters had expected. The global economy is moving along decently and remains in expansion territory – decelerating but not declining. In contrast, the bearish narrative rests on the trend of slower economic growth (and its accompanying headwinds) signaling a future recession. According to this line of thought financial markets will continue dropping as corporate earnings and economic data fall back in line with historical trends. The majority of data points do not indicate that a recession is imminent, rather, that this economic cycle has been extended but will not end soon. Nevertheless, the truth is that nobody knows with certainty what will come next. While the last quarter of 2018 may have been miserable for equity investors, it certainly wasn’t the case for investors holding high quality bonds, especially federal government bonds or U.S. Treasuries. It feels like a long time since we saw bond and equity returns materially de-couple, but we saw it this past quarter, re-affirming the long-held view that government bonds provide a safe haven in times of equity market turmoil. The safe-haven trade during the quarter resulted in a decline in interest rates across the entire yield curve in both Canada and the U.S., with the biggest decline occurring in December. The 10-year Government of Canada yield fell 46 bps over the quarter, while the 2-year yield was down 35 bps – large moves when yields are still at very low levels. Corporate bond yields, on the other hand, did not decline to the same extent, with the lowest quality bonds experiencing a move higher in yields. For the quarter, the Canadian bond market (FTSE Canada Universe Bond Index) returned 1.8%, with the long-term bond market up 1.9% and the short-term bond market increasing 1.4%. Notable sub-sectors include the federal government long bond index, which was up a whopping 4.7%, while the corporate long bond index returned a modest 0.3%. In terms of fundamentals, economic data in both the U.S. and Canada remained supportive of continued interest rate normalization, with each central bank increasing its target policy rate by 25 bps during the quarter, although both central banks appear to be much more cautious with respect to future rate increases. In fact, at its early December meeting, the Bank of Canada cited several negative expectations in its statement, including materially weaker activity from Canada’s energy sector, a greater-than-anticipated negative impact on global economic activity from trade conflicts and reduced momentum in Canadian economic growth. The outlook for the bond market feels more uncertain compared to only a few short months ago. Central banks in Canada and the U.S. have expressed increasing caution as the global economic growth picture has become cloudier. As such, we continue to believe that active management is key to navigating the current fixed income environment and the incorporation of non-traditional fixed income strategies should be considered as another tool for adding value during more uncertain times. As mentioned, stock market volatility in 2018 was markedly higher than in 2017, with equity markets witnessing a sharp correction in the year’s final weeks as investors questioned the narrative of strong global growth. The correction’s magnitude was enhanced by a continuation of trade-related uncertainties, political instability, monetary policy tightening and a seasonal liquidity reduction due to tax-loss selling. In local currency terms, very few equity markets were spared this quarter, however Emerging Markets provided somewhat of a bright spot, returning 0.1% in December and -2.2% for Q4. The U.S. equity market lost 8.6% over the period, yet was one of the few regions to deliver a positive return for Canadian investors in 2018, up 4.2%. 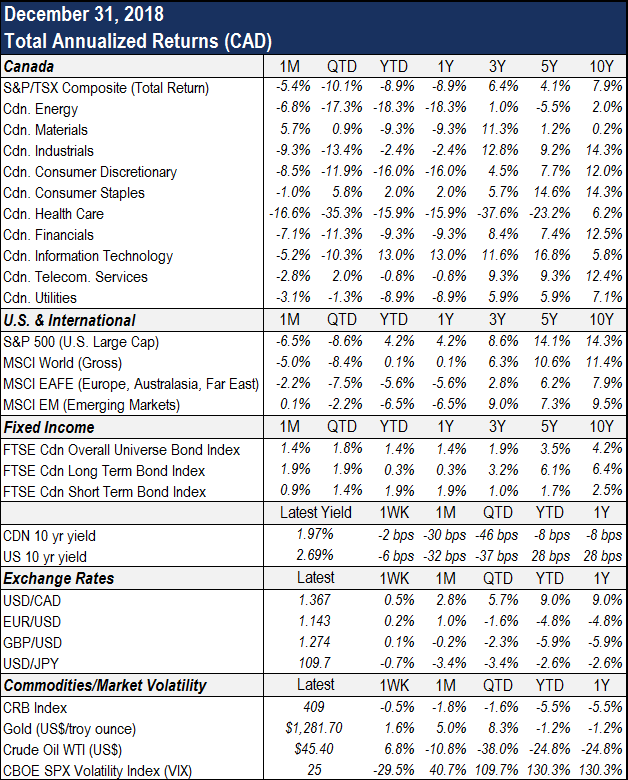 International markets outside North America fell 7.5% in Q4. Canadian equities declined 10.1% over the period, with energy stocks under severe pressure as international investors abandoned the market due to regulatory issues. 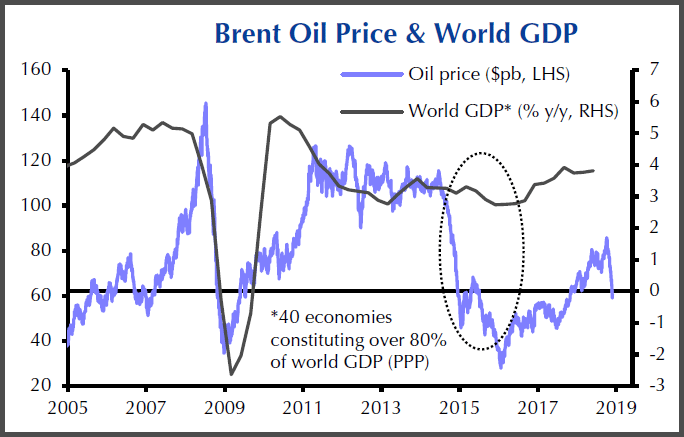 While falling energy prices helped dampen inflationary pressures (see chart), the negative impact to Canada’s stock market outweighed the positives this quarter. Corporate profitability announcements have also begun weighing on investor sentiment, with slowing economic growth and higher costs likely to impact bottom lines come earnings season. Despite a challenging equity market performance, Canadian business fundamentals have been solid, with TSX net profit margins near 30-year highs. However, market participants deem this level unsustainable given the headwinds that typically arise in the later stages of a business cycle, including rising interest rates. What remains to be seen is whether economic growth can stay strong enough to support corporate earnings despite various risks. As stock market turbulence is projected to extend into 2019, a focus on staying the course to achieve long-term investment goals is more important than ever. We must remind ourselves that as investors, the market tumult we are witnessing is the price we must pay (and tolerate) to achieve returns that over long horizons are typically much stronger than those of cash or bonds. Just as there are no free lunches, there are no excess returns without risk. How quickly sentiment regarding global economic growth has changed in just one quarter. For 2019, we continue to expect the global economy to grow, albeit it at a lower rate than the past few years. Further, additional risks have developed in recent months which has rendered the outlook more uncertain. Despite the uncertainty, our portfolios remain strategically positioned to favour equities within the context of each client’s target asset mix as we believe the asset class provides long-term investors with superior returns. Given the potential for a more challenging investment environment, we have been ensuring that client portfolios are defensively positioned to minimize volatility where appropriate. In addition, for clients with regular cash requirements, we continue to manage the portfolio to ensure sufficient liquidity to meet their needs.